Parking: Is the trailhead deserted, or overflowing? When do you need to arrive to be sure you have a spot? 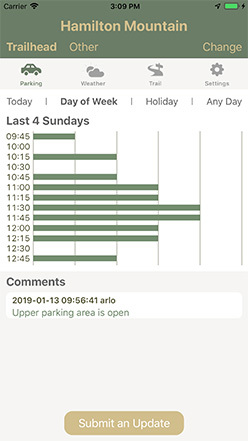 How does the usage change on weekends and holidays? Weather: What's it like right now? How is that likely to change throughout the day? How much colder or windier will it be at higher elevations? Trail: Should you pack gaiters or microspikes? Will you need to deal with downed trees or overgrowth? Is a washout blocking the route? 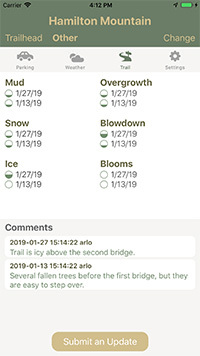 TrailCheck lets you select a trailhead, or a specific location on a trail, to view current conditions. 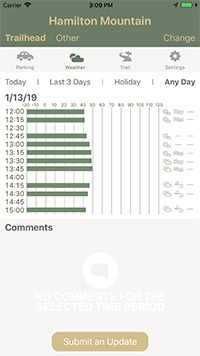 Or use the time filters to show averages for recent days or similar days to help predict what you'll run into. Contributing to TrailCheck's database is easy. Click to submit a parking, weather or trail update and optionally select a location on the trail. 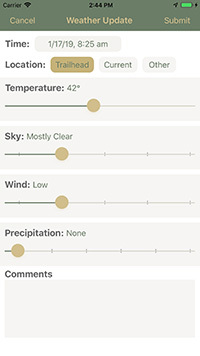 Move a few sliders to show the conditions, and add comments if you want to share more details. You can enter updates from the trail, back at the trailhead or from home later. Every submission makes the app work better! Note: TrailCheck is currently in an introductory period and is free to use. Eventually it will require a paid subscription. We will notify users with pricing details before making any changes.